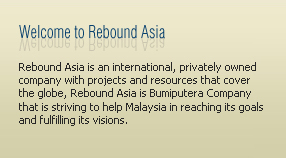 Incorporated in 1995, Rebound Asia is a 100% Bumiputera owned company registered with Kementerian Kewangan Malaysia. Rebound Asia has a proven track record of successfully completing large government and commercial projects in ICT products fulfillment, solutions and applications development and implementation, and support / maintenance. Rebound Asia has received numerous commendations for timely delivery of projects from various ministries/agencies of the Malaysian Government. Today, Rebound Asia has developed strong internal competencies and a solid collaboration with various strategic partners to deploy quality Total Solution for our customers.